Emmanuel Tussore presents for the first time in Berlin his ongoing project “Study for a Soap”. His works debate the severe destruction of a cultural heritage. 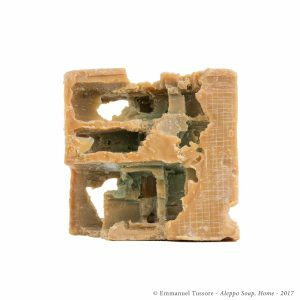 Symbolic for every day of the bombardments of Aleppo, the artist molded a new ruin out of a piece of soap, which is produced in the world’s oldest city. Emmanuel Tussore (American/French) was born 1984 in Monaco. He began his career in street photography after graduating from the Institut d’Estudis Fotografics de Catalunya in Barcelona in 2006. His intercultural background inspired him to explore historical and cultural themes in other mediums such as video, sculpture and installation. His work has been shown in various national and international exhibitions including the presentation of Sirens at Berlinale Berlin International Film Festival 2017, Dak’Art 2016 Biennale of Contemporary African Art and Nuit Blanche Paris & Brussels 2016. Emmanuel Tussore answers Alexandra Saheb’s questions about his project. Soap is a quite unusual material in art practice. How did you start using soap from Aleppo and why specifically from this city? I’ve been a big consumer of Aleppo soap for many years, it’s part of my daily hygiene care. My local oriental supermarket had only one type, a stock produced in 2012. Knowing it came from Syria and the war started then made the soap special and precious to me. We were in 2016; this was the trigger. I was washing my body with something that had a direct physical link to a place where millions of other bodies were suffering and dying, a place that was no more for the millions of refugees massively escaping to Europe. From our Western perspective, war is always far away and remains abstract. Here the material is the link. Sculpted, photographed, filmed, the soap’s meaning shifts from the refined gesture of the civilized man to the symbol of a destructive brute force. Please share with us the key moment when you started with the immense work of producing several thousands of ruins, what was your motivation? What is your goal with the series of exhibitions of Aleppo Soap? I’d like to show this work in every European capital because of what is at stake today. Walls are rising again, and nationalism have never been worse since my grandparent’s days. Favorite place: Auvergne (region in the center of France) at my family’s countryside house, it’s in the hills, in the middle of the forest; a perfect place for a retreat.